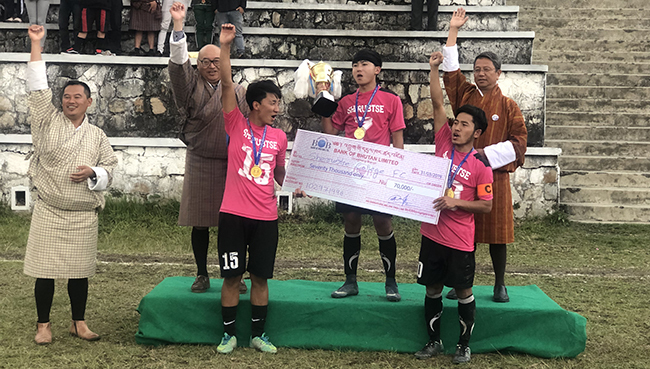 Sherubtse College has won the title of the 5th JNEC Open Football Tournament 2019 after defeating Samdrup Jongkhar FC (SJ FC) 2-1 in the re-match of the final at the Thangzor Stadium, JNEC on Monday. This is the second time Sherubtse College lifts the JNEC Open trophy. It won its first title back in 2017. Both the teams lived up to the expectation of the spectators and never failed to entertain with their skills and team work. Dominating the possession, Samdrup Jongkhar FC took the lead in 62nd minute in second half. However, SJ FC’ celebration was short lived when Sherubtse College netted an equalizer in the 85th minute. And in the last dying seconds, Sherubtse striked the winning goal to seal the victory. The final match was graced by Gajel Lhundup, Registrar, Royal University of Bhutan. The winners were awarded a cash prize of Nu. 70,000/- while runners took home Nu. 35,000/-. The runner-up prize money was sponsored by, the State Mining Corporation Limited (SMCL), Samtse. This year JNEC Open saw 16 team from various region participating in the tournament.